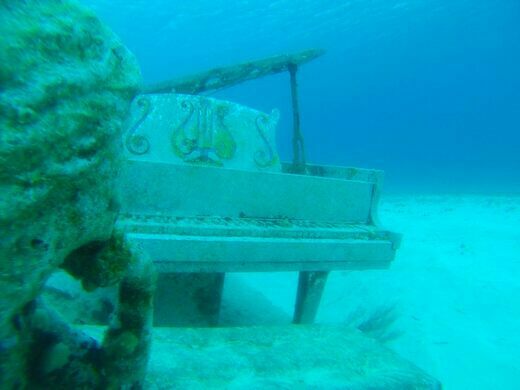 A strange surprise waits beneath the waves for snorkelers splashing through the waters around magician David Copperfield’s private islands. 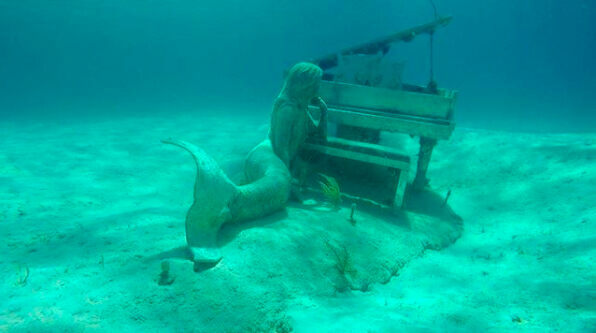 Just off the coast of Rudder Cut Cay, swimmers will find a life-sized sculpture of a mermaid lounging atop the sandy ocean floor. 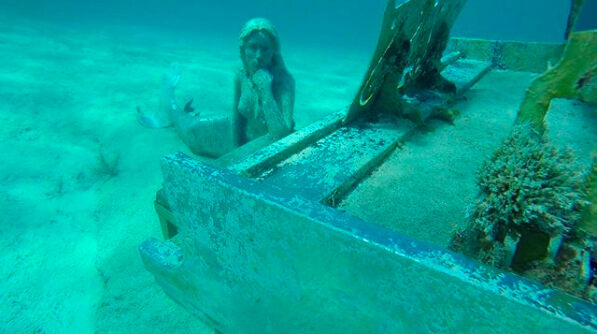 The mermaid waits near the bench of a baby grand piano as if beckoning divers to sit down and play her a tune. 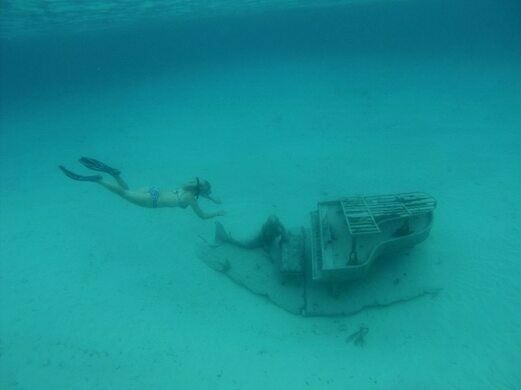 The stainless steel sculpture is hidden about 12 to 15 feet below the surface and can be a bit difficult to spot when the current stirs up the sand and clouds the water. It makes discovering them on a clear day feel all the more magical. 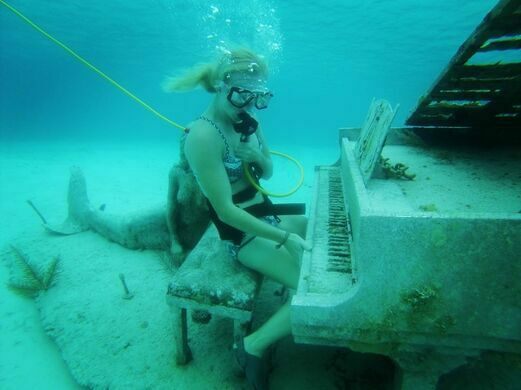 Snorkelers capable of holding their breath for a while like to swim down and pose atop the bench as if they, too, belong in this underwater world. 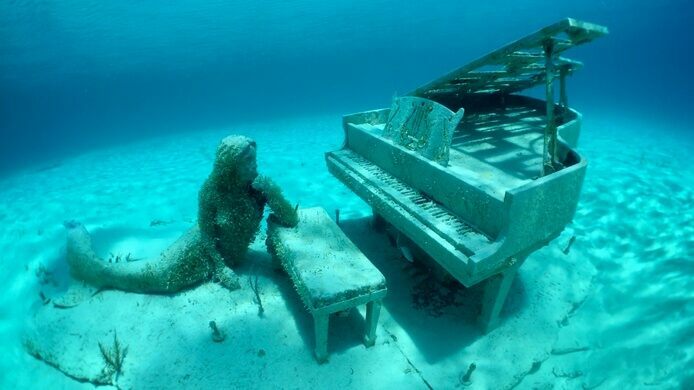 Copperfield, who owns multiple private islands within the Bahamas, commissioned the artwork from Jason DeCaires Taylor and had it sunk as a quirky surprise for the few, exclusive guests who stay on the private island or those who take boat trips to snorkel off the shore.